A fruity interpretation of the traditional kabob, this treat is as fun to make as it is to eat! 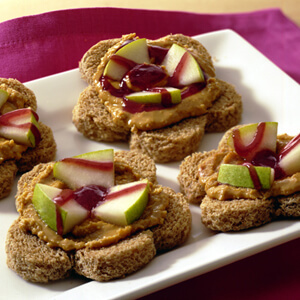 Makes a pear-fect after-school snack! In a small bowl, combine the vanilla yogurt and strawberry preserves. Set aside. Thread the fruits by alternating the pears, bananas, pineapple, and strawberries onto the skewers. Serve the fruit skewers with a dollop of the strawberry sauce on the side.